A flicker of the flame, embers in the great black. On the one hand, I’m disappointed for her, because I know that she’s going to be disappointed. On the other hand, it seems like Scar knows something about being an echo that we haven’t heard yet, because he seemed sad that she was breaking through. So maybe I’m glad for her that she doesn’t have to deal with whatever he was thinking of. 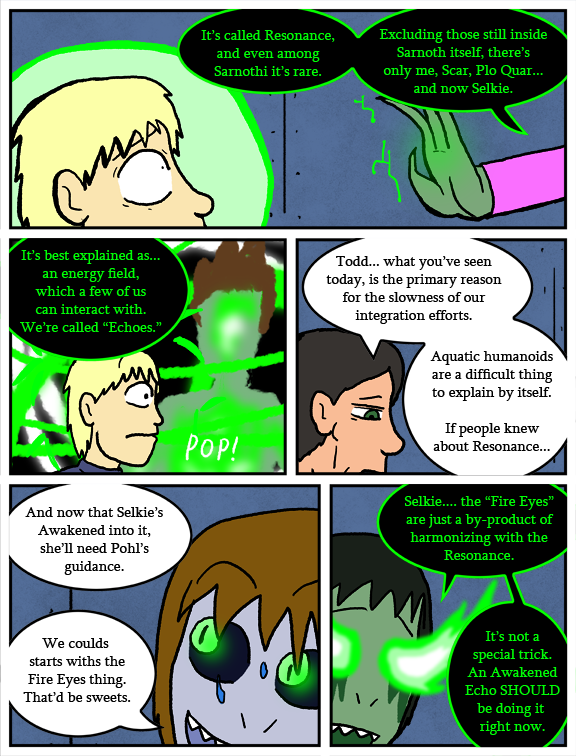 Also, I think Todd is now glad that Selkie only had glowing eyes, rather than abruptly spitting fire from them. He was sad because he saw how weak her powers are I’d think. or maybe she´s simply still too young to ‘awaken’ fully – that she´s showing signs of having the gift after wearing that overpowered suppressor for years is a miracle in itself – or her gift still needs more time to recover now that its finally not ruthlessly supressed anymore. if brown didn´t think/fear that she´ll grow more powerful then mere glowing eyes he wouldn´t want pohl to guide her. Dave your link seems broken. This comic is getting deep again. Selkie’s mother appears to have made horrifying choices, to keep her daughter from being exploited and weaponized. And Selkie is still too young to understand anything other than “I might have cool powers!”. There’s a slim chase she did this by mistake – earlier they said the supressor was done hastily and calibrated too strongly. That still would’t redeem her in my eyes though it would be less so than if she deliberatelly left Selkie crippled. Again, not saying it was /right/ to do, just that it’s not the same as breaking Selkie’s legs. Kind of a Harrison Bergeron situation. It’s like giving Andrew Wiles or Magnus Carlsen a brain injury. In Volume one in book form, there is a three page comic that explains that Plo Quar was not an original soldier in the war, but rather dragged into it. Selkie is very much crippled in her abilities as an echo. Or as being an echo and using resonance is very much a psychic or mental ability, would you prefer we used the term “brain damaged” ? PRO: Giving an implant to a child can allow them to hear almost normally, and interact with the hearing population like a hearing person would, thus improving their language acquisition and ensuring that they’re not significantly hampered or ostracized by the lack of verbal communication. Failing to provide them with this at a young age has definite lifelong effects that are detrimental to the child’s development, self-esteem, ability to get a job, and so on. CON: Sometimes these implants cause significant problems for the person, including unstoppable ringing/buzzing noises or white noise — they’re not perfect. Also, the focus on restoring hearing means a reduced focus on ensuring that they can communicate by sign, which might be the skill they need throughout life if the implant proves to be a bad choice for that individual. Also, providing the implant at a young age reduces or eliminates the ability for that person to grow up as part of the Deaf culture, which hearing people generally can’t really grasp. Deaf culture is valuable, and Deaf people don’t like to be considered to be deficient (“human minus hearing”), which the early-Cochlear mindset considers them. I forget the other arguments; those are just the ones that stuck in my brain. It’s one of the few controversial issues where I can see why each side would consider the other wrong. And I could see similar arguments made about suppressing or not suppressing the Gift in a kid like Selkie. What you are describing is about fixing a defect while what Selkie’s mom did was inflict one. To modify your analogy to fit it would have to have parents take steps to take away their healthy childs ability to hear – which I think anyone would agree would be wrong. Except, Mikael, that’s not quite accurate either. It’s more akin to a child being born with the possibility of superior auditory sensitivity (such as being capable of hearing frequencies outside of the human norm) then getting adjusted to fit the normal human baseline of normal hearing. Again this is not a justification, of course, but it doesn’t do anyone a service to misrepresent what has happened to Selkie here. She isn’t being knocked below a normalized level for her own species; she’s being robbed of a gift which would make her superior (but potentially also a slave). It seems like her mother made the choice between “either Selkie never gets to know her own people for fear of them exploiting her gifts, or deny Selkie those gifts so she can some day return to her people like a normal sarnothi.” I don’t believe those were the only options, but they appear to have been the only options which Selkie’s mother believed were feasible. Where is this being a slave thing even coming from? Pohl is an echo. 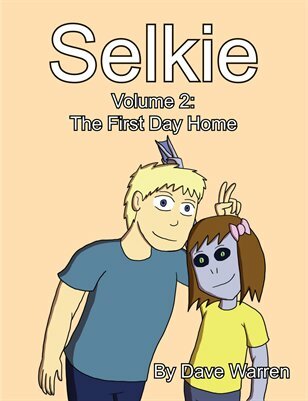 The subtext of https://selkiecomic.com/comic/selkie969/ and https://selkiecomic.com/comic/selkie970/ combined with some hints in Dave’s reply comments over the past couple of weeks. Heh, haven’t thought of that comic in a while. I forget, Dave, if you’ve indicated that you ever read Girl Genius. Because this is very much the kind of thing that happened to the main character. As far as Mikael’s comment about trying to correct a defect vs. trying to remove a normal capability… there are those who say that “fixing” Autism or Bipolar in a person is taking something away from that person, and that stigmatizing these qualities is failing to understand the benefits they have — that the world would be poorer if these qualities were eliminated through e.g. genetic manipulation or other corrective options before the kid is born. I spoke at length with a person who actually has Bipolar and has this mindset, and I walked away not understanding what the benefit was, but only understanding that the person thought that being “cured” would be a negative thing because that was her level of normal, even though both states were negative ones in her eyes and caused her a lot of problems. Autistics can have unique ways of looking at the world. That one’s more understandable as a possible good. Selkie’s abilities are being portrayed as an unmitigated good, by Pohl and some others, but we still don’t know her mother’s motivation, and the “spook some humans by showing that magic exists” thing isn’t insignificant, nor is the possibility that Selkie being one of only four Echoes might lead to her being unable to lead a “normal” life, not because of her powers but because of how they are coveted by the community. Even if they don’t physically force her to use her powers for them, they may pressure her enough (directly or inadvertently) that she feels she has no choice. Removing the choice and setting her at “normal” might actually be the only way to avoid these problems; the question is, how strong an effect are these problems going to have on Selkie? Well said, Kilyle (both times). From a deeply personal point, I’d also like to weigh in with the real world example of intersex infants. Intersex has been considered a “medical defect” for a very long time, and so doctors were instructed to perform “corrective” surgery on new born infants, often without even informing the child’s parents. It has only been in recent years that this act has been given widespread attention, largely thanks to some individuals who had received such surgeries as infants and grew up with self-gender confusion or resentment. When such people did some digging, genotyping revealed their biology as different from what the “normalizing” surgery made their physical appearance. If I recall, the first lawsuit in the u.s. of an intersex person suing the hospital responsible ended in a win for the person, and fairly recently. I bring this up, since I reread my posts in this subject chain, and I really want to stress that I do not condone Selkie’s mother’s actions. I think it was a terrible decision and something which harms Selkie. However, I can understand her decision. It’s the same one which those doctors made. It’s a wrong decision, but their bias and limited understanding made it their only course of action. We can’t always repair the damage such decisions make, but we can spread the word and educate, so that the mistake isn’t made again on another child. small thought… are you using b or html to create the link? Might need to try the other one. Given how many typos you had in this reply alone, I think proofing might do a world of good in preventing future broken URLs, heh. Selkie will learn. AND SHE WILL SURPASS. And now they have the pleasure of giving Selkie the bad news of what her mother’s gift has been doing to her all these years. My guess is Selkie is going to have a long and slow recovery involving an echo’s version of rehab. … Is what I would be saying if my reply to that one guy complaining about Selkie awakening despite the suppressor hadn’t failed to post and been just long enough for me to say, “[stuff] it.” and not repost it. Which I think is why Plo Quar tried to suppress it.